its innovative Eco-city Indicator System. The NHK team, upon visiting the site, was impressed by the speed and quality of SSTEC’s progress to date. The news feature will show the city’s progress in both technical/intellectual development as well as built construction. NHK expressed interest to follow this booming project as it continues over the years and encourage the participation of Japanese and global expertise in Tianjin. 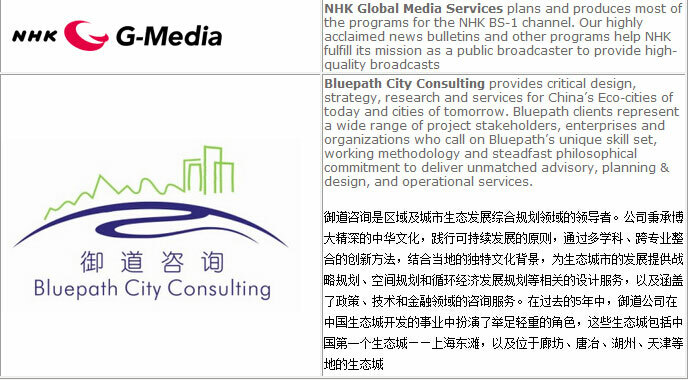 The NHK news program Featuring Mr. Dong and Bluepath’s pioneering Eco-city work is set to air this December.